Freedom the power or right to act, speak, or think as one wants. Or the state of not being imprisoned or enslaved. In many parts of the world, freedom is something that is taken for granted. Take for example, the freedom to choose any religion we want (or no religion at all). Or to be in a relationship with the person we love, to travel…the list goes on. Unfortunately, there are many places in the world where these freedoms are not available to most people. There are still people in the world who are forced to live empty, unfulfilling lives so the rulers of their countries don’t have them thrown in jail or worse. If you don’t know what it means to be afraid to voice your opinion, then you can consider yourself very lucky to live in a place where liberty is a priority as well as a basic human right. 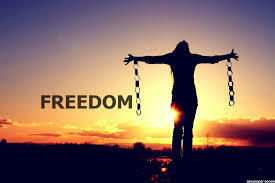 And like all good things, liberty should be celebrated, and that’s what World Freedom Day is all about.